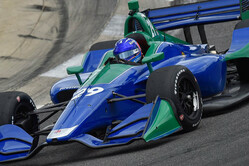 Fernando Alonso completed his maiden IndyCar road course test at Barber Motorsports Park with Andretti Autosport. "It was a good day, a fun day," said the two-time world champion and 2017 Indianapolis 500 Rookie of the Year. "I love to test new cars and to test the IndyCar on a road course is something special. "I've been lucky enough to test it in wet conditions, in intermediate conditions and in dry conditions," he added, "so overall I had a good feeling on every type of track. The weather was good for us, a little bit of wind in the afternoon but overall a positive day." Asked whether he prefers road courses to speedway, he replied: "Probably my instinct will tell me road course, because it's what I've been used to doing all my life, but the Indy 500 was an amazing experience, so 50/50. "I love the way the car feels on a road course," he continued, "but I love the way you compete on ovals, timing the tows, traffic and all the overtaking manoeuvres I think are a little bit easy on the ovals, so in terms of track action I loved the Indy 500. "It was something that I was looking for last year already," he said of the road course outing. "I had some options to test the car on a road course after the Indy 500, but we didn't find the time. But this year it's definitely happened and I'm happy for this. "I love being behind a steering wheel, and definitely a new car, a new experience, learning a lot of things from the team, the engineers, everyone, so a happy day." Alonso: "It's good-bye... but who knows?"